This is a great lunch or light dinner to spice up your week. 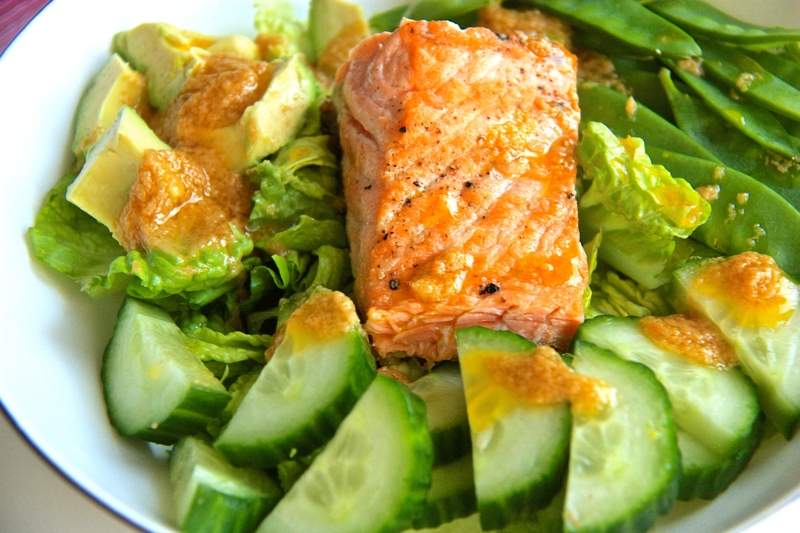 The dressing made with ginger and garlic give this dish a kick that pairs nicely with the fresh vegetables and salmon. To make the dressing, combine all of the ingredients into a food processor except for the grape seed oil and pulse until it is all finely ground. Gradually add the oil and mix to combine. For the salmon, heat a pan over medium high heat and add the oil. Sear the salmon on both sides, for 2-3 minutes, or until golden and cooked through. Depending on the thickness of the fish, or the desired degree of doneness, place in preheated oven for an additional few minutes. Cool slightly. To make the salad, combine all of the vegetables into a bowl. Add the salmon on top and coat with the dressing. Serve and enjoy. Feel free to add any of your favourite vegetables or swap the salmon for tuna to make your own version of this salad!